As stolen from Trudy’s restaurant in Austin, Tx. Y’all, I have spent more than a few years drink testing every margarita I can find. Most places get it wrong. They throw a bottle of Master of Mixes margarita mix in with some tequila and call it quits. These places are not worth returning to. However, there are some gem restaurants that actually take the time to craft a drink worth drinking. 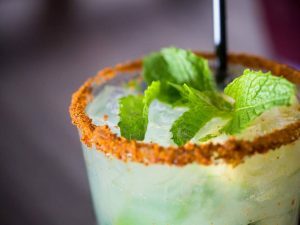 Something with the tartness of limes, the sweetness of sugar, the bite of citric, and dusty agave taste. These places are worth returning to in order to figure how how they make the drink and shamelessly steal it. And, believe me, I have spent a lot of time visiting and revisiting various places in order to learn their secrets…and steal them! The best one I have found is the Mexican martini from Trudy’s in Austin, TX. In the name of science I drank a lot of these. True story: Trudy’s will only serve you two of these. Back when there were just 3 Trudy’s, people would start at the North Star location, drink their two. Catch a taxi to the original location. Two more. Then head to the old south location and two more. Then they added a fourth place and moved the south location. After that most people couldn’t make it past 3 places. But a few stalwart souls could handle the trip. Then Trudy’s integrated all of their locations into one system because of like alcohol poisoning or something. Whatever. Anyway, I developed a fine sense of what a good Trudy’s Mexican martini should taste like and I’ve added a bit of something of my own. Add in the 3 shots of limeade. Wet the rim of a glass/mug and dip the rim into the Tajin. Spin to get a good coat. Strain the mix into the glass. Float a sprig of cilantro as garnish. Now, you’re probably thinking, “WTF is Tajin?! ?” It’s a mix of dried Mexican chilies and lime salt. It’s not spicy so much as it hints at a spice with the tang of limes. It’s amazing on corn, eggs, cauliflower, actually it’s fantastic on just about anything. And enjoy! But, please be responsible. This little drink goes down real easy, but it packs a bit of a punch. So be careful. Oh, and if you really want to make this a drink for the summer everyone will remember, add a tablespoonish of jalapeno pepper juice. The sweet tartness from the limeade with the tequila flavors will be taken up a bunch of notches by the jalapeno spiciness. Oh yes. Alright, y’all. I need to go make me a few of these and get cracking on the next book!